The Monetary Policy Committee (MPC) of the central Bank of Nigeria (CBN) has cautioned the federal government against external borrowing as the nation’s rising debt profile, especially external debt is now close to pre-2005 Paris Club debt exit. Currently Nigeria’s foreign debt is more than $22.08 billion, while local debt is over N3.48 trillion. This is even as the MPC resolved to retain all economic parameters as in previous months. Thus it retained the MPR at 14 per cent; the asymmetric corridor of +200/-500 basis points around the MPR; the CRR at 22.5 per cent; and the Liquidity Ratio at 30 per cent. The Committee which noted the increase in the debt level and advised for caution, saying that it “could fast be approaching the pre-2005 Paris Club exit level”, also expressed concerns about rising inflation, security situation, persistence of herdsmen attacks on farmers and late implementation of the 2018 Budget. 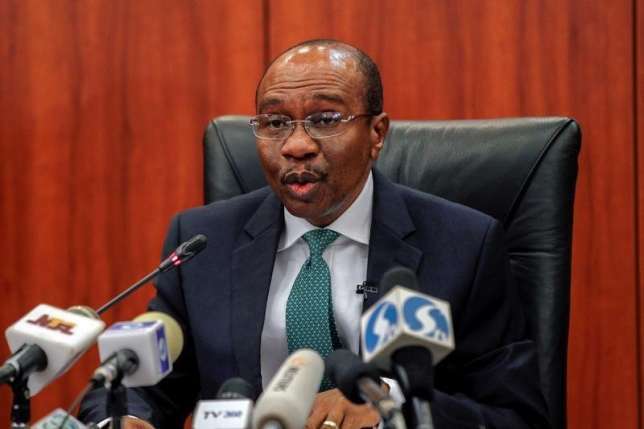 The CBN Governor, Godwin Emefiele, expressed these concerns while reading the MPC communique to Journalists at the end of the two-day meeting of the committee which was the first in the year, 2019. Although, the MPC projected Gross Domestic Product (GDP) growth rate of 2′.28 percent for the year, 2019, it noted that the growth remains fragile. AccordIng to the CBN Governor who presided over the meeting , “The outlook for growth, however, remains fragile as the late implementation of the 2018 budget and the residual impact of flooding and security challenges, constitute headwinds to growth. Emefiele however said the committee believes that the effective implementation of the 2018 capital budget and the ERGP, improvement in the security situation, and continued stability in the foreign exchange market will enhance aggregate demand and output growth. Further, he said the committee observed with satisfaction, the contribution to stability in the market of the implementation of the Bilateral Currency Swap Agreement (BCSA) with China and the inflow of the US$2.8 billion Euro bond. He expressed confidence that the marginal increase in the external reserves, from US$42.54 billion at end-December, 2018 to US$43.28 billion as at January 21, 2019, and further improvement would strengthen investor confidence in the Nigerian economy. The CBN Governor said the Committee commended the government’s focused expenditure on investment in infrastructure and urged the Federal Government to sustain the pace towards addressing the infrastructural deficit in Nigeria. The Monetary Policy Committee (MPC) held its first meeting for fiscal 2019 on 21st and 22nd January, 2019 amidst concerns over the slowdown in global economic activity, arising from on-going trade tensions, tightening global financing conditions and mounting external debt in Emerging Market and Developing Economies (EMDEs). On the domestic front, the resurgence of moderate inflationary pressure and possible threats to accretion to external reserves due to softening crude oil prices were noted. The Committee reviewed the developments in the global and domestic economic and financial environments in 2018, as well as the risks and outlook in the short to medium term. Eleven (11) members of the Committee were in attendance. The Committee noted the divergence in performance of most economies in 2018 leading to moderation in global output. In addition, a combination of factors including: financial market volatilities, trade war between the US and key allies, continuing monetary policy normalization by the US, BREXIT, the termination of the European Central Bank’s (ECB) asset purchase program in Dec 2018 and the slowdown in the Chinese economy, further heightened uncertainties for the global economy in 2019. Consequently, global growth has been downgraded by the IMF to 3.5 per cent in 2019, from 3.7 per cent in 2018. The Committee noted the gradual increase in global inflation, with inflationary pressures intensifying in some EMDEs who have in the recent past faced currency depreciation arising from capital flow reversals arising from progressive monetary tightening by the Federal Reserve. It is, however, expects that the recent decline in oil prices may reverse the trend, especially for oil importing economies and thus moderate currency depreciation in these countries. The Committee noted the continued recovery in output growth in the domestic economy after the 2016 recession as real GDP grew by 1.81 per cent in Q3 2018 from 1.50 per cent in Q2 2018. The services and agricultural sectors continued to drive output growth, contributing 1.19 and 0.56 per cent, respectively. However, the persistence of herdsmen attack on farmers, cattle rustling and flooding in some parts of the country affected agricultural and livestock output. Based on the Manufacturing and Non-Manufacturing Purchasing Managers’ Indices (PMI), output growth for Q4 2018 is expected to expand further. The expected performance projected in the PMI is attributed to continued stability in the foreign exchange market, improvements in the flow of financing resources to the real sector through the various interventions by the Bank, effective implementation of the Economic Recovery and Growth Plan (ERGP) and the increase in non-oil sector GDP. The outlook for growth, however, remains fragile as the late implementation of the 2018 budget and the residual impact of flooding and security challenges, constitute headwinds to growth. The Committee, therefore, believes that the effective implementation of the 2018 capital budget and the ERGP, improvement in the security situation, and continued stability in the foreign exchange market will enhance aggregate demand and output growth. The Committee noted that the broader measure of money supply, M3, grew by 16.58 per cent in 2018, above the provisional benchmark of 13.0 per cent. Broad money (M2), also grew by 12.17 per cent in December 2018 over its level at end-December 2017, in contrast to the provisional benchmark of 10.48 per cent for 2018. The increase in M2 reflected the growth in Net Foreign Assets (NFA) of 18.54 per cent in December 2018, above its provisional benchmark of 14.50 per cent. Credit to the private sector rose marginally by 12.97 per cent below its provisional benchmark of 12.40 per cent while credit to government grew by 33.77 per cent in December 2018, above its benchmark rate of 17.40 per cent. The Committee noted the appreciable growth in credit to the private sector which had been a constraint to growth in the real sector and expressed optimism of further improvement in lending, through the sustained effort of the Bank to enhance credit delivery to small and medium scale industries in the economy. The MPC, thus, commended the Management of the Bank for its efforts so far in sustaining credit delivery to the real sector of the economy. The resurgence in inflationary pressure in the economy was of concern to the MPC as headline inflation (year-on-year) inched up to 11.44 per cent in December 2018 from 11.28 per cent in November 2018. The increase in headline inflation was driven by food inflation which rose to 13.36 per cent in December 2018 from 13.30 per cent in November, while Core inflation declined marginally to 9.77 per cent in December 2018 from 9.79 per cent in the previous month. The Committee, however, observed that the uptick in inflation was attributed to seasonal factors which impacted mainly on food. Consequently, all measures of inflation, month-on-month, showed a decline. Thus, headline, food and core inflation declined to 0.74, 0.81and 0.50 per cent in December 2018 from 0.84, 0.90 and 0.68 per cent, respectively, in November 2018. The Committee observed that the near-term risks to inflation remain: the residual impact of flooding on agricultural output, insecurity in parts of the food producing belts of the country, exchange rate pass-through to inflation due to weakening oil price and campaign-related spending towards the 2019 general elections. Accordingly, the MPC urged the Federal Government to sustain its current effort towards improving security to ease the food supply chain bottlenecks. Money market interest rates in the review period, generally reflected the level of liquidity in the banking system as the average Inter-bank call rate declined significantly to 7.17 per cent in November 2018 from 14.18 per cent in October 2018. The Open Buy Back (OBB) rate which stood at 6.57 per cent in October 2018, increased marginally to 6.76 per cent in November 2018. On December 24 and 31, 2018, the interbank call and OBB rates, however, closed at 14.00 and 18.94 per cent, respectively. The improvement in net liquidity position and interest rate reflected the combined effects of the CBN quasi-fiscal operations, OMO auctions, maturing CBN Bills and foreign exchange interventions as well as statutory allocations to state and local governments. The Committee observed the decline in the equities market for the most part of 2018. On a year-on-year basis, the All-Share Index (ASI) decreased by 17.81 per cent from 38,243.19 at end-December 2017 to 31,430.50 at end- December 2018. The All-Share Index (ASI) further decreased by 1.35 per cent to 31,005.17 as at January 18, 2019. Similarly, Market Capitalization (MC) decreased by 13.87 per cent from N13.61 trillion at end-December 2017 to N11.72 trillion at end-December 2018. It further declined by 1.37 per cent to N11.56 trillion as at January 18, 2019. The Committee observed that these developments largely reflected the impact of the progressive monetary policy normalization in some advanced economies and the sustained profit taking activities of foreign investors arising from perceived political risk in the build-up to the 2019 general elections. The MPC, however, remained optimistic of the gradual reversal of the current trend in the medium term, given the current stability in the foreign exchange market and the external reserves position, as well as continued improvements in key macroeconomic indicators. The Committee noted the relative stability at both the Bureau-de-Change (BDC) and the Investors’ and Exporters’ (I&E) window of the foreign exchange market, supported by the Bank’s proactive exchange rate management policies. It also observed with satisfaction, the contribution to stability in the market of the implementation of the Bilateral Currency Swap Agreement (BCSA) with China and the inflow of the US$2.8 billion Euro bond. The Committee also noted the marginal increase in the external reserves, from US$42.54 billion at end-December, 2018 to US$43.28 billion as at January 21, 2019, noting that these improvements would further strengthen investor confidence in the Nigerian economy. The outlook for inflation in the first half of 2019 is mixed, with the expectation of an increase in the near-term before a gradual decline towards the mid- year. Inflation is expected to rise marginally amidst palpable tailwinds, which include increased spending preparatory to the 2019 general elections and continued disruptions to the food supply chain in the insurgency prone areas and herdsmen attack regions of the country. The MPC appraised the possibility of external shocks in 2019 as the outlook for the global economy remains uncertain due to the effect of on-going trade tensions between the US and its key allies, slower growth in China, unclear direction of BREXIT negotiations and continuing monetary policy normalization in some advanced economies. The Committee was of the view that oil prices may, however, remain relatively stable, within the US$50pb bracket in view of recent OPEC’s production cutting actions. The Committee noted with satisfaction, the performance of the economy in 2018, highlighting the achievements in key macroeconomic indicators in the face of global uncertainties and domestic challenges. In particular, it noted the stability in the exchange rate, stable accretion to external reserves, moderation in inflation and the low but gradual improvement in real GDP growth in the last six consecutive quarters commencing from Q2 2017. The MPC further noted. The MPC noted that given global economic conditions and the risk confronting emerging markets and developing economies in recent times, as well as the limited productive capacity of the economy, the managed float foreign exchange management regime of the CBN has delivered the most optimal results when compared with other emerging markets in recent times. Consequently, capital flows into the domestic economy has continued unabated after an initial lull. The Committee, considered the risks to the global economy, noting the downward revision in projected global output in 2019, the adverse impact of the trade war between the U.S and its major trading partners, likelihood of lower crude oil prices, impact on capital flows of continued monetary policy normalization by major advanced economies, distorted signals on BREXIT negotiations, as well as pockets of other socio-political tensions and perceived election risks on the domestic front. The Committee commended the government’s focused expenditure on investment in infrastructure and urged the Federal Government to sustain the pace towards addressing the infrastructural deficit in Nigeria. It noted that the immediate impact of this approach on GDP may be slow in coming, but will eventually expand the economy’s productive base, reduce unemployment and increase aggregate demand in a more sustainable manner and over a long period of time. The Committee acknowledged the strategic role of the private sector in economic growth and remained concerned over the slow growth in credit to the private sector through 2018, noting the sudden increase at end- December 2018. The MPC commended the initiative of the Bankers Committee in addressing the phenomenon of low credit to the small and medium scale enterprises through partnering with the Nigeria Incentive- Based Risk Sharing System for Agricultural Lending (NIRSAL) to establish a national Microfinance bank with branches in all States and Local Government areas of the Federation to provide low interest rate lending to small scale businesses. A further initiative by NIRSAL with the CBN to de-risk lending to small scale enterprises is also being fine-tuned. On external borrowing, the Committee noted the increase in the debt level, advising for caution, noting that it could fast be approaching the pre-2005 Paris Club exit level. The MPC also noted that although there was an increase in the inflation rate for the second consecutive month, month-on-month inflation continued to moderate, indicating that the year-on-year measures will also moderate in the near term. This is supported by the stability in the naira exchange rate and thus, urged the Bank to sustain this stability. To this end, it welcomed the narrowing of the exchange rate premium between the BDC segment and the Investors’ and Exporters’ (I&E) window of the foreign exchange market. The Committee also noted with satisfaction the gradual reduction in Non- Performing Loans of the deposit money banks (DMBs) which has further strengthened their balance sheets. The Committee believes that as Government pays off contractor debt and other obligations, there will be a sizable reduction in the NPLs of the banking system. The Committee also noted the attempt by Government to broaden the base of the Value Added Tax (VAT) and urged the authorities to expedite action in that respect, arguing that increased tax collection will reduce the pressure on government expenditure and create fiscal buffers to improve macroeconomic management. The observed and recent high foreign capital inflow into the Nigerian economy despite the perception of election risk, is evidence of the confidence of the international community in the country’s macroeconomic management and provides a compelling reason for the Committee to await clarity on macroeconomic performance after the general elections in February and March 2019. In the light of the observed risk confronting the economy, including the global and domestic inflationary pressures, which have intensified the risk of currency depreciation, the MPC was of the view that a loosening option was very remote. Weighing the balance of its judgement on price stability conducive to growth, the MPC felt that tightening would result in the loss of the gains so far achieved, noting that this may drive the banks to reprice their assets; thus increasing the cost of credit as well as elevating credit risk in the economy. It will also worsen the position of non-performing loans of the banks. The Committee also felt that tightening would dampen investments and hamper improvements in output growth, given the already fragile growth performance so far achieved.